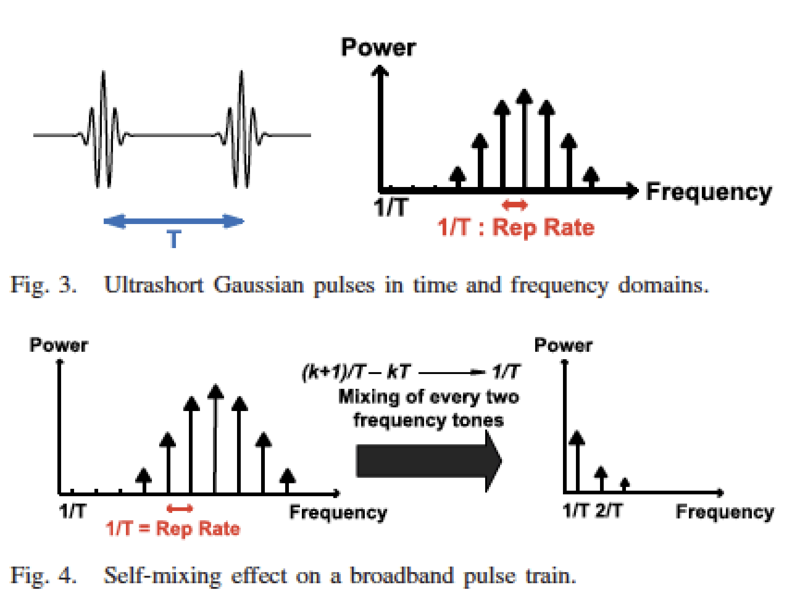 Our research presents a millimeter-wave impulse receiver to detect the amplitude of picosecond pulses and extract their repetition rate with low timing jitter. 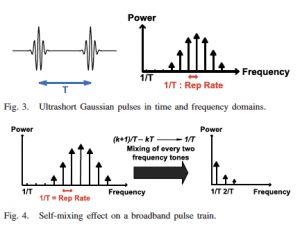 The receiver is based on a self-mixing technique, which extracts the repetition rate by mixing multiple frequency tones of the pulse. The receiver, which is integrated with a broadband on-chip antenna, enables wireless time transfer with an accuracy of 0.38 ps. The fabricated chip is used to detect the amplitude and the repetition rate of sub-6-ps pulses. 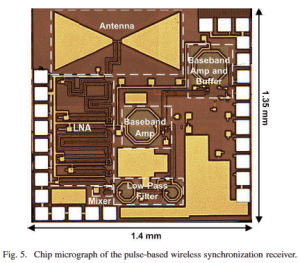 A tunable baseband amplifier is designed to amplify the extracted repetition rate in the 2–10-GHz range. Analysis of the self-mixing technique, simulation results of the receiver blocks, and measurement results of a multichip wireless synchronization test are reported. The fabricated impulse receiver was utilized in three different test setups and the measurement results were reported for a multichip wireless synchronization test as well as a picosecond pulse test. It is successfully shown that multiple widely spaced receivers can be locked to the same 4.5-GHz clock with a subpicosecond rms jitter. 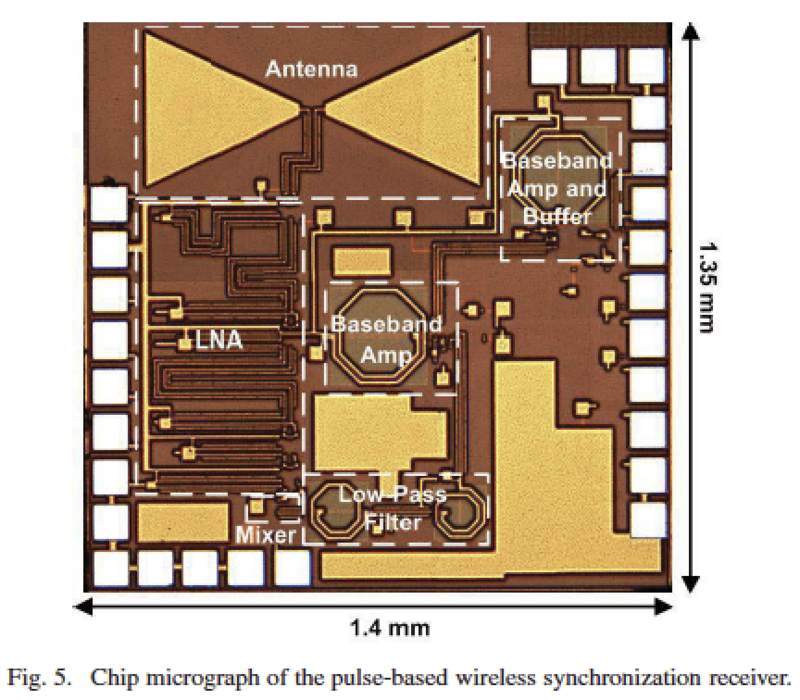 B. Jamali and A. Babakhani, “A Self-Mixing Picosecond Impulse Receiver With an On-Chip Antenna for High-Speed Wireless Clock Synchronization,” in IEEE TRANSACTIONS ON MICROWAVE THEORY AND TECHNIQUES, VOL. 66, NO. 5, MAY 2018.